Here’s my Easter story: When I was about seven-years-old my mom thought it’d be a smart idea to hide the Easter eggs in the backyard before the family trotted off to church. All throughout mass I fidgeted, anxious to get home for the annual egg hunt. When we got home I got my empty egg carton and stood by the backdoor waiting for my older brothers, who at this point were not as excited as me for the hunt, and waited which seemed like forever for my father to set up his movie camera. My mom finally opened the door and as I ran out, I stopped in my tracks. Confetti colored egg shells covered the backyard. Little Stevie started to cry. Yup, our doggie, Chula, who had three litters and more than 30 puppies in her lifetime, had eaten all of the dyed eggs! My mom forgot to put her away in the garage while we were at church. Today I think back and and smile, missing those innocent times when my family was together and my mom was alive. 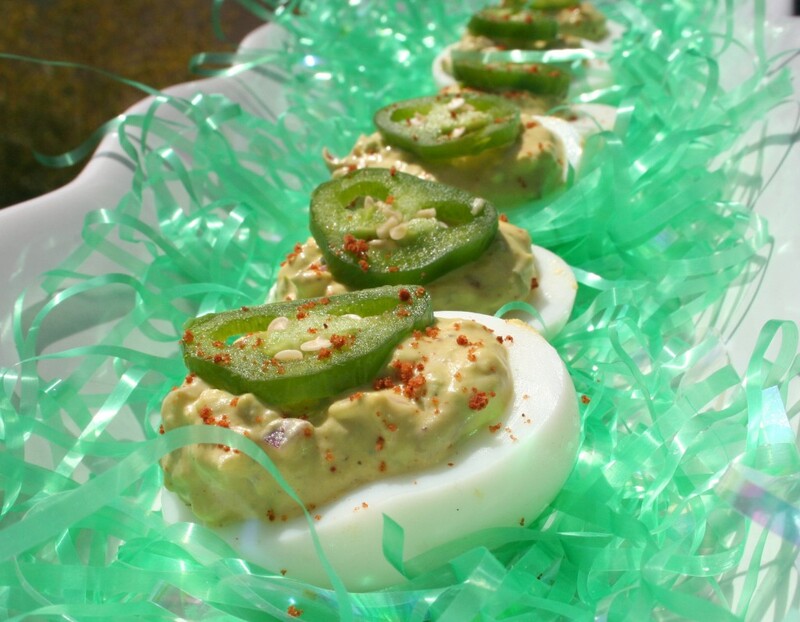 This year I wanted to do something different with our traditional deviled eggs recipe. I added diced jalapeños and smashed a California avocado into the mixture. The results — devilishly tasty! Slice eggs in half lengthwise and scoop yolks into a bowl. Mash yolks with a fork and stir in mayonnaise and other ingredients. Spoon filling into egg halves and sprinkle each egg with chipotle pepper with a thin sliced jalapeño.